Russian President Vladimir Putin holds a replica of the Tupolev-160 strategic nuclear bomber at the Olenogorsk military airbase near Murmansk, 16 August 2005. Photo: Russian Defence Force. 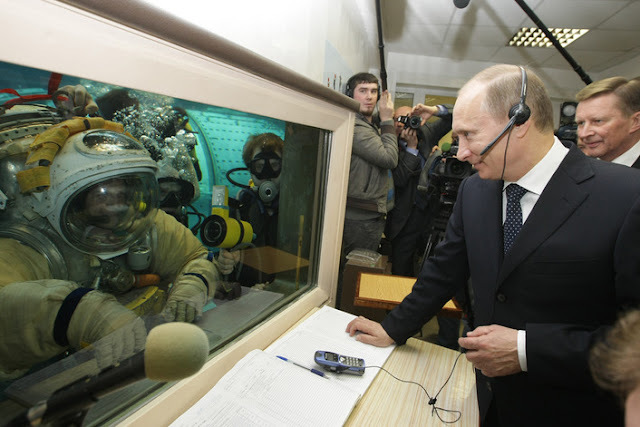 After a health check, Putin donned a flight suit and took the commander's position in the strategic bomber, which was piloted by Major General Anatoly Zhikharev, and co-directed by a Lieutenant Colonel in charge of navigation. 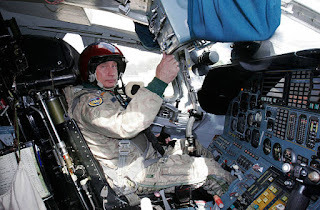 Vladimir Putin, then Russia’s President, sitting in the cockpit of Tupolev Tu-160 strategic bomber at a military airbase, outside Moscow, before his supersonic flight in the carrying bomber. The Tu-160 (Western code-name Blackjack) or ''white swan'' in Russia is the world's long-range bomber ever exist, that could reach the United States without mid-air-refueling. 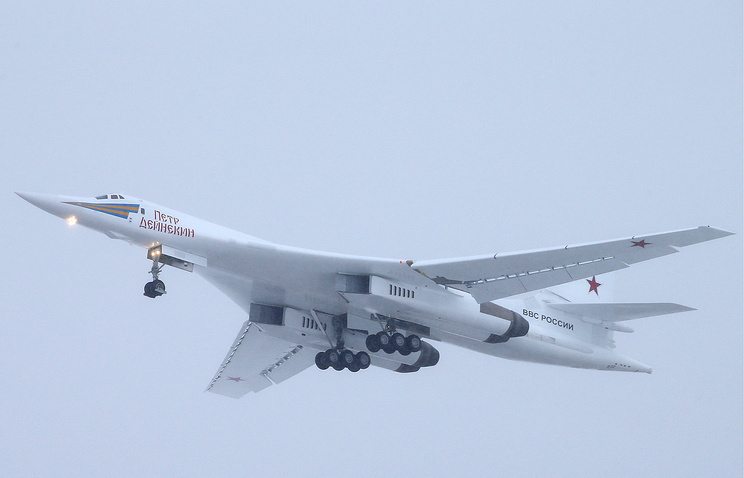 Tu-160 is looks similar to the Rockwell B-1 Lancer, however is a very different aircraft. Tu-160 is much larger and much faster than the B-1B--with a maximum takeoff weight over 606,000lbs and a top speed greater than Mach 2.05. By contrast, a B-1 Bomber weighs in at 477,000lbs and slower as compared to the Blackjack. The Tu-160s primary armament has always been long-range cruise missiles like the Kh-55MS--of which it can carry dozen in its weapon bays. In recent months, the Russians have used the conventional version Kh-555 cruise missile against ISIS' fortified targets in Syria with the combination of Kh-101 an advanced cruise missile. the result was superb! Soviets designed the Blackjack primarily as a means to deliver a nuclear thunder strike to the enemy assets while retains the ability to do low-level penetration. The ''Blackjack'' has broken the world record as the only long-range bomber ever with 12 300 km without refueling. The aircraft also carries the nuclear-tipped Kh-102 weapons. The aircraft had a fly-by-wire control system all cockpit, long pointed radome houses, and radar for target identification plus a forward-looking TV camera used for visual weapon aiming. The initial development program of the Tupolev Tu-160 prototype was extremely expensive and protracted. The first prototype flew in 1981 under U.S.S.R' flagship and the second aircraft was lost in 1987. The technical breakthrough was made, the first aircraft successfully tested and became operational in 1987. Following series of production at Kazan Training and Research Center continued until in 1992, when President Boris Yeltsin announced that no further strategic bombers would be built after his predecessor, Mikhail Gorbachev went into negotiation with U.S. President George Bush (senior) and signed a Joint Statement that outlined the two sides' approach to the START treaty I. It is believed that the production has created an estimated of 39 Blackjacks. Also, there were some incomplete airframes left throughout in major part of Soviet Union specifically in Ukraine. This bomber was extremely expensive to build and to maintain. Tupolev Tu-160 it the second version of the Soviet bomber after the Tu-95 (Wester reporting name Bear), that could reach the United States without mid-air-refueling. However, the Tu-160 could never replace the aging Tu-95 due to its astonishing price. In 1989 the Tu-160 reached a speed of 2 200 km/h for the first time. However, later maximum speed was limited to 2 000 km/h in order to extend the service lives of the engines and airframes. Armament: The Blackjack armed with Kh-55 (Western designation AS-15 Kent) cruise missiles and Kh-15 (Western designation AS-16 Kickback) air-to-surface missiles. The aircraft can carry a total of 12 Kh-55 and up to 24 Kh-15. Both of these missiles can carry nuclear warheads. Missiles are carried in two internal weapon bays. The Tu-160 can also carry free-fall bombs with a maximum weight of up to 40 t. This bomber designed to destroy and obliterate the most important enemy assets with one single blow. It asserted that the Tu-160 has a low radar cross-section, however, it is by no means a stealthy aircraft. Deployment: A total of 19 Tu-160s were delivered to the 184th Guards Heavy Bomber Aviation Regiment at Priluki (Ukraine) beginning in May 1987. These bombers were left at the Ukrainian military base after the break up of the USSR in 1991 and, after protracted discussions between Ukraine and the Russian Federation, eight were returned to Russia in 1999. The scrapping plan of the remaining Tu-160s held in Ukraine began in late 1998 under the contract and consultation issued by the US government. In early 2001, six Russian Tupolev Tu-160s were declared operational as air-launched cruise missile carriers under the provision of START treaty. These bombers were assigned to the 121st Guards Heavy Bomber Aviation Regiment at Engels in the same year. Upgrading: The strategic bomber Tupolev-160M is to be provided with new upgrading system as planned for the Russian military in the year 2021, Defense Minister Sergei Shoigu said on Wednesday 30 January 2019. "The work on producing the upgraded Tupolev-160M proceeds on the time. The first serially plane will be provided to the Russian military in 2021," Shoigu said at a conference in Kazan devoted to Russian Aerospace Force hardware maintenance. 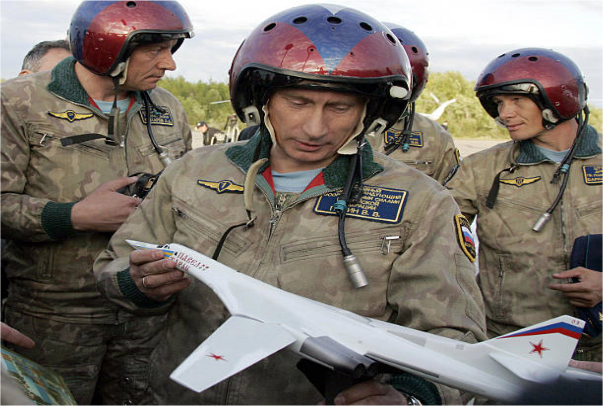 Some sources claim that Russian Air Force currently operates 16 of these strategic bombers. In 2014, a new plan of overhaul and modernization of the T-160s begun at the Tupolev plant. The first modernized Tu-160M bomber was rolled out in 2016. Upgraded and refurbished aircraft are fitted with new radars, electronics and navigation equipment. It was announced that newly-build bombers will be fitted with new engines, new radars, and new avionics. The newly-built bomber is referred to as the Tu-160M2. So even though it will look similar, the Tu-160M2 will be essentially a new warplane. In 2018 a contract was signed to produce a couple of Tu-160M2 bombers for the Russian Air Force. It is expected that by 2020 more than a dozen of Tu-160s bombers will be upgraded and will be in operational service with the Russian Air Force. US-based Platforms International corporation has acquired three demilitarized ex-Ukrainian Tu-160s's engine hardware which it planned to convert them as launchers for space vehicles. However, this move was never done. By 2017 a total of 16 bombers were operational with the Russian Air Force, plus one more was being upgraded to the Tu-160M standard. Major upgraded bombers were planned to be delivered in 2019, but the plan to upgrade all operational bombers to the Tu-160M standard is incomplete. Deliveries are planned to be completed in 2027. 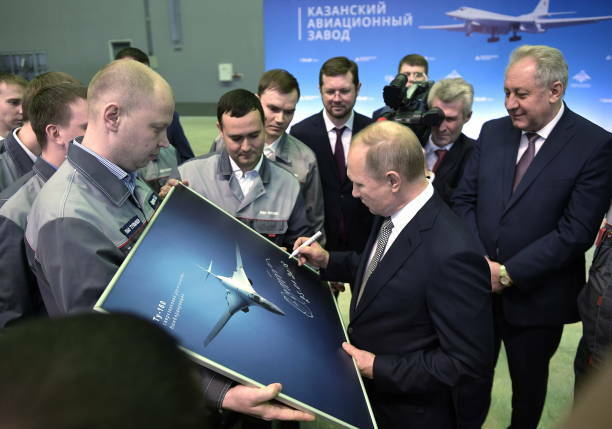 A planned price of a Tu-160M2 is $1.5 billion.